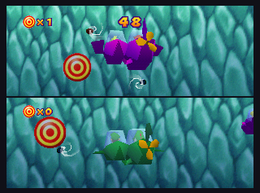 Torpedo Targets is a 2-vs-2 minigame found in Mario Party 2. One player in the team pilots a submarine while the other player shoots torpedoes at targets. Every time a target is destroyed, another target appears and the teams have to find it. The player who operates the torpedoes can also stun the other team by launching torpedoes at them. The team that destroys the most targets wins. Game Rules – "The submarine pilot and torpedo launcher must cooperate to hit as many targets as possible." Advice – "You can steer torpedoes after launching them. You'll have more success if you keep the torpedoes in view." An ocean sunfish can be seen swimming around the upper part of the area. This page was last edited on February 3, 2019, at 20:30.